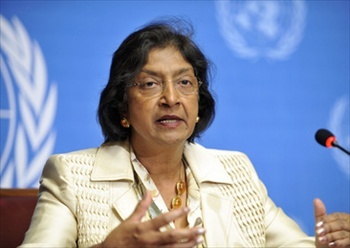 Navi Pillay, UN High Commissioner for Human Rights, told a press conference in Geneva: “The collective actions of the people of North Africa and the Middle East have reaffirmed the importance and universality of human rights in a way we could not have dreamed of on 1 January this year. She said the Tunisians and Egyptians “had blown that myth away,” leading citizens of other countries in the region wondering if they could do the same, and so the protests had spread. She said her office’s budget is $202 million, reportedly about the same amount as Australians spend each year on Easter eggs or the cost of three F-16 jet-fighter airplanes. “The amount Europeans spent on their pets in 2010 alone (€56.8 billion) would fund the entire UN human rights system, including my office, for something like 250 years,” she said.